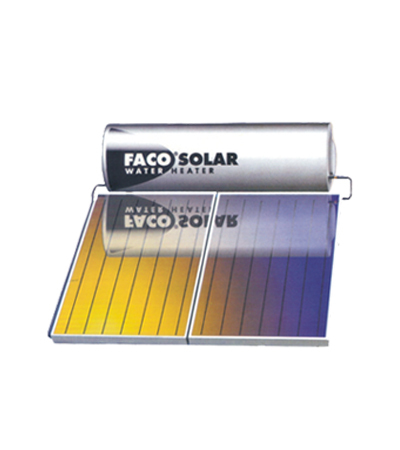 FACO solar water heater has uncompromised standards for convenience, efficiency and environmental conservation. It enables savings of up to 90% on energy costs for water heating due to this solar heating technology. LONG TERM VALUE: A single installation ensures years of hot water for multiple household use. COST EFFECTIVE: The initial cost of installation will be defrayed by continued savings from energy bills. MAINTENANCE – FREE: Marine grade 316 stainless steel storage cylinder, weatherproof “Colorbond” casing, light sensitive collector panels and other class 1 materials used requires almost no maintenance. INSTANT HOT WATER EVERYTIME, ANYTIME: Based on the infallible “thermosyphon” principle, FACO Solar Heaters are formulated to perform independently. Even on days of continuous rain and even during low sunshine seasons, the unit still performs optimally with the electric booster to ensure hot water all the time. POLLUTION-FREE: Solar energy is clean energy – free from pollution generated by coal, fossil fuels, diesel or nuclear energy. NO-FUSS INSTALLATION: An on-site feasibility survey and a study to locate the shortest connections from the system to usage points in the house is all required.